Saint Stanislaus, Bishop and Martyr - My Catholic Life! For many centuries, the coronation ritual of a king was considered to be a Sacrament of the Church. Such was the importance of the king’s role in protecting and promoting the faith in his realm that his enthronement was embellished with a liturgical pomp and splendor similar to the ordination rite of a bishop. The sacramental character of a king’s coronation was not reflected, however, in the ritual by which a woman became a queen. Only a man could be crowned, in the same way that only a man could receive Holy Orders. The parallel duties which kings and bishops owed to both Church and Kingdom sometimes led to irresolvable conflicts. Bishops resented kings infringing upon ecclesiastical affairs, while kings resented bishops meddling in civil matters. Since civil and religious life was, until very modern times, utterly intermingled in most cultures, the high tensions generated by the nearly co-equal powers and responsibilities of kings and bishops inevitably led to bloodshed. The blood of today’s saint was spilled precisely due to such high tension. Saint Stanislaus was the Bishop of Krakow, Poland, in the century just after that nation’s baptism after the conversion of its king. 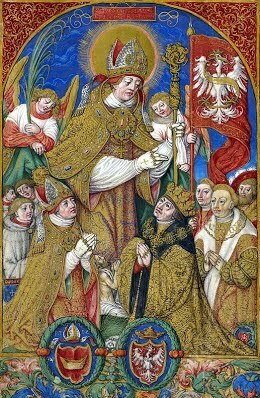 Saint Stanislaus had various and serious disputes with Poland’s King Bolesław II: over property, over a war, and over the King’s moral failings. This led to Stanislaus excommunicating Bolesław, in seeming support of the King’s enemies. Although the precise details of this King-Bishop conflict have been lost to history, it is clear that Bolesław was outraged by Stanislaus’ sanction and labelled him a traitor. When the King entered Krakow’s Cathedral for Mass, the service was immediately halted due to his excommunication. Bolesław went into a fury and actively sought Stanislaus’ blood. The henchmen the King sent to assassinate Bishop Stanislaus, however, refused to carry out the deed. So King Bolesław entered through the doors of the chapel outside the city where the Bishop was saying Mass and cut Stanislaus down himself. Bishop Stanislaus was immediately venerated as a martyr, his relics were transferred to the Cathedral, and he was canonized a saint a century and a half after his death. For centuries, Polish kings were crowned at the splendid tomb of the martyr in the central nave of Krakow’s Cathedral. 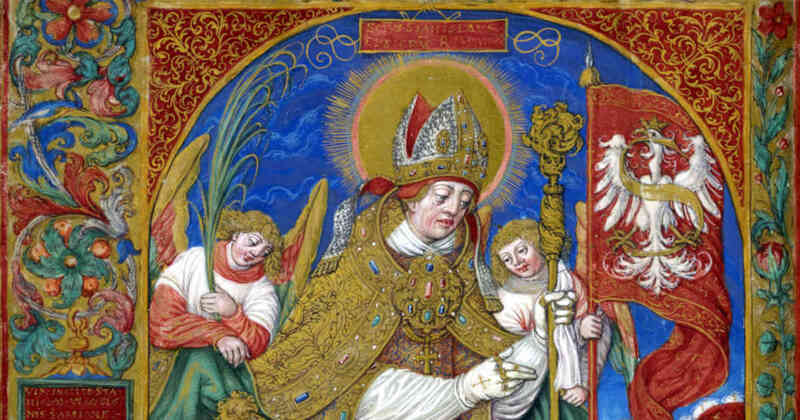 Saint Stanislaus is one of the patron saints of Poland, being especially venerated in the Archdiocese of Krakow. On November 1, 1946, a young Polish man named Karol Wojtyła, in love with God and country, was ordained a priest and celebrated his first Masses in Krakow’s Cathedral of Saint Stanislaus. Father Wojtyła went on to become the seventy-sixth Archbishop of Krakow. He later became a Cardinal and then Pope John Paul II. He is now a saint. Pope Saint John Paul II had a great devotion to Saint Stanislaus and often prayed at his tomb. The Pope even planned his first pastoral visit to Poland to coincide exactly with the nine-hundredth anniversary of the saint’s martyrdom. John Paul II’s trip missed the exact anniversary, due to a lack of cooperation from the communist government, but the pope didn’t miss the year. 1979 turned out to be a pivotal year for Poland. The papal pilgrimage unleashed various social movements that brought communism to its knees a decade later. The memory of long-ago Saint Stanislaus, then, played a remote role in conquering a deeply unjust modern government. Many details about the life of Saint Stanislaus are lost in the fog of the past. Only a basic outline of his life is possible. But his heroic example, precisely as a bishop, gave Karol Wojtyła a model to follow in his own life as a Polish bishop and Pope in far different circumstances of civil and ecclesiastical tension than those of the eleventh century. We can speculate that on May 13, 1981, when Pope John Paul II was shot and almost killed by a state-sponsored assassin, he thought of the state-sponsored attack which ended Saint Stanislaus’ life so many centuries before. Civil and Church power still clash, even in modern times, as the 1980 murder of the El Salvadoran Archbishop Saint Oscar Romero also proves. Pope John Paul II survived, thank God, perhaps through the intercession of the great patron of Poland we celebrate today. Saint Stanislaus, you fearlessly confronted those who threatened the well-being of the Church, and so gave a heroic example of martyrdom to an entire nation. Help all who seek your intercession to be as brave and forthright as you in the face of threats and adversity.